If you want to create a uniform smile that rivals popular Hollywood stars, dental veneers are the best way to do so. We can place veneers on the surface of your visible teeth, covering your enamel and leaving your actual tooth intact. This allows us to transform the appearance of your teeth in a way that is far less invasive than actually replacing your missing teeth. Dental veneers are incredibly versatile and can close gaps between teeth, cover dark stains, make them appear to be straighter, and even change their shape and size. If you like the sound of what veneers can accomplish, but want a solution that is less invasive and more affordable, consider dental bonding. In this procedure, we do not need to remove any of your enamel and can place the bonding material on your teeth after roughening and moisturizing them. 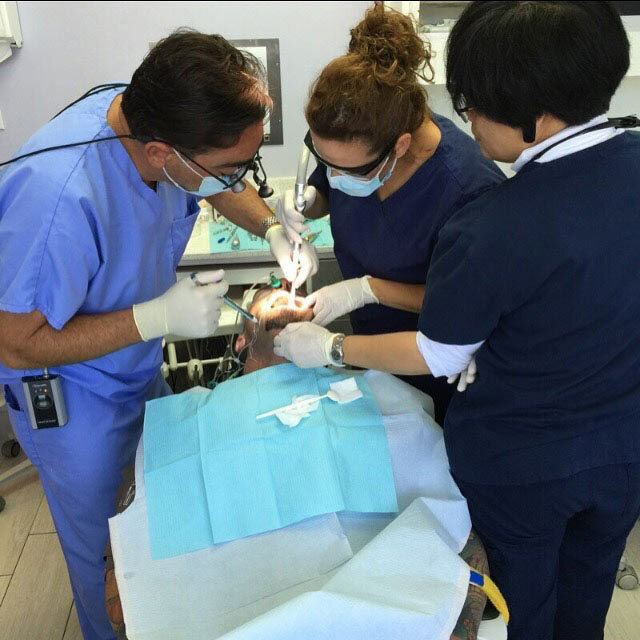 We then shape the bonding material, place the material and harden it with a dental light. Bonding material makes it possible for you to walk in with gaps between your teeth and leave with a complete restoration. While bonding material may not last as long as a veneer or crown, it is durable and can look completely natural. As one, we know how thrilled our patients are with the results. For patients who have lost one or all of their teeth, dental implants are an ideal alternative to wearing dentures. In this procedure, a titanium post is placed under the gums and secured to the jawbone. The body treats titanium like natural matter, so the two elements will fuse together through the process of osseointegration. This process means that the jawbone will provide the same level of stability and biting power to your implant as it would to a natural tooth. As a result, you can eat your favorite foods and continue with all your normal activities without thinking about your teeth. We also provide dental bridges as a tooth replacement solution for people who want a secure option but prefer to avoid oral surgery. A bridge is an excellent solution for partial tooth loss when there are remaining natural teeth that can support the bridge after a crown is placed between them. The results are natural and semi-permanent. As an experienced cosmetic dentist, we have numerous procedures that can be completed to improve the appearance and functionality of your smile. To learn more about dental bonding or dental implants, give us a call at (323) 431-2319 and schedule a consultation. « What Are Partial Dentures and How Are They Used?